1The authors are with the Department of Electrical Engineering, Sharif University of Technology, 11365-11155 Tehran, Iran (e-mail: mhadi@ee.sharif.edu). Resource allocation with quality of service constraints is one of the most challenging problems in elastic optical networks that is normally formulated as a mixed-integer nonlinear optimization program. In this paper, we focus on novel properties of geometric optimization and provide a heuristic approach for resource allocation that is much faster than its mixed-integer nonlinear counterpart. Our heuristic consists of two main parts for routing/traffic ordering and power/spectrum assignment. It aims at minimization of the transmit optical power and spectrum usage constrained to the quality of service and physical requirements. We consider three routing and three traffic ordering procedures and compare them in terms of total transmit optical power, total received noise power, and total nonlinear interference including self- and cross-channel interferences. We propose a posynomial expression for the signal-to-noise ratio in which fiber nonlinearities and amplified spontaneous emission noise have been addressed. We also propose posynomial expressions that relate the modulation spectral efficiency to its corresponding minimum required signal-to-noise ratio. We then use the posynomial expressions to develop six geometric formulations for the power/spectrum assignment part of the heuristic that are different in run time, complexity, and accuracy. Simulation results demonstrate that the proposed solution has very good accuracy and much lower computational complexity in comparison with mixed-integer nonlinear formulation. As an example, for the European Cost239 optical network with 126 transmit transponders, the geometric formulation can be more than 22 times faster than its mixed-integer nonlinear counterpart. 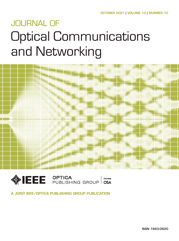 Numerical results also reveal that, in long-haul elastic optical networks, considering the product of the number of common fiber spans and the transmission bit rate is a better goal function for routing/traffic ordering that can reduce the total transmit optical fiber (total accumulated noise and nonlinear interference) up to 20% (15%).